Dropbox is an efficient software tool which will safely store your data on a remote server, allowing you to access your files from anywhere you are, using any device (phone, computer or tablet). Being a highly functional software, Dropbox will also allow you to remotely edit documents, automatically upload photos from your device or to play videos no matter where you are. Dropbox also empowers you to share your files or photos with your friends or collaborate with your team members like you are all using the same computer. Dropbox has advanced privacy features, allowing you to control who can access and see your data. 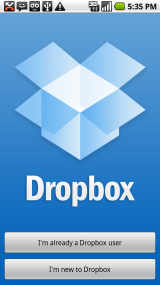 You can use Dropbox to safely create and store a backup copy of your important data. You will be able to easily restore it in case that your device gets lost or damaged. All your data is protected using a two-step verification system and the 256-bit Advanced Encryption Standard (AES-256). Save documents on your PC, then use the files on your gadget from anywhere. Send your whole wedding video to your friends with a simple link. It's simple to share big documents with anyone - even if they don't own a Dropbox account. Back up vacation pictures directly from your phone or PC. This way, memories are safe as soon as you create them. Edit a presentation with your colleagues without emailing documents back and forth. When you work with a document in a shared folder, everyone receives the update undoubtedly. Lost your phone? Your pictures, documents, and videos are safe. Just sign in to Dropbox from any gadget, and your documents will be there waiting for you. The cloud service offers 2 GB of free storage. The synchronization process is too slow. Compared to the competition, the service offers very little initial storage for free. Dropbox has been tested by Download82.com team against viruses, spyware, adware, trojan, backdoors and was found to be 100% clean. Our editors will recheck this software periodically to assure that it remains clean.